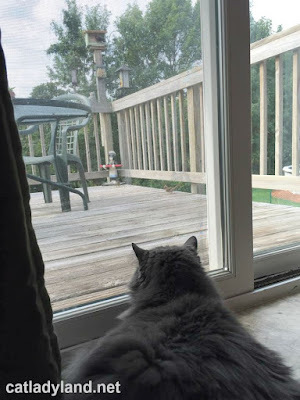 Saffy's obsession with the outdoors is fueled by the hungry beasties that gather at the bird feeders on our deck. And we have quite the variety of hungry beasties - squirrels, chipmunks, blue jays, chickadees, finches, sparrows, and the occasional cardinal. Saff's wild chirps can't keep up with all the frantic seed-eating activity on the other side of the door. I'll bet if I opened the screen, she'd jump into the air and swoop across the deck like a giant flying squirrel to get to those guys. She'd even grow those flying squirrel "wings". I'd pay good money to see the wings happen. Wishing for an open screen door and wings.